Brenda O’Connell Barry spoke on tonight’s Late Late Show, after winning the award earlier today. CORK WOMAN BRENDA O’Connell Barry has said that she hopes to help others in her situation in Ireland after being named Carer of the Year. She received the award for the care she gives her four-year-old son Fionn, who suffers from a rare genetic condition that can cause him to scream for nine days in a row with the pain he’s suffering and means he requires round-the-clock care. 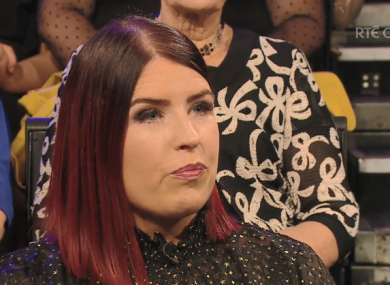 The Charleville native appeared on tonight’s The Late Late Show on RTÉ and told Ryan Tubridy that carers like her need greater support. “The therapies we give him, we have to do privately,” she said. “I hope that I can help other carers in Ireland because everyone is struggling. We’re on our knees and we’re not getting the help. Everyday we work so hard, and we get knocked back. She said that therapies such as physio and speech and language therapy are essential, but face long waits for these services. Congratulations to Cork's Brenda O'Connell Barry who is the overall winner of the @CarePlusIreland Carer of the Year Awards 2018!! The prognosis for Fionn was not good when he was a toddler, and with tireless care provided by Brenda and the rest of their family they do their best to take care of him. She said: “We have a little boy who can’t sit up, walk or talk… It has been like hell on earth during those periods of extended agitation. We’re blessed to have help from the Jack and Jill foundation. They took us out of the darkness. Everyday is different with Fionn. He can turn himself inside out in a matter of hours. He could give you a smile and that can light up our life. The doctors thought he wouldn’t see two. Everyday that goes by they’re mesmerised with how he’s surviving. She got a warm reception from the studio audience, as did Shauna Tighe who was awarded one of the young carers of the year. Email “Ireland's carer of the year: 'We're all on our knees, we all need support and we're not getting it'”. Feedback on “Ireland's carer of the year: 'We're all on our knees, we all need support and we're not getting it'”.